Mais Foy, cette fois-ci, évite le sensationnalisme, optant pour des joutes psychologiques où les effets spéciaux s’accordent avec harmonie. A horror retread of such brainless, shameless lameness that it’s hard to imagine anyone begging for another installment. 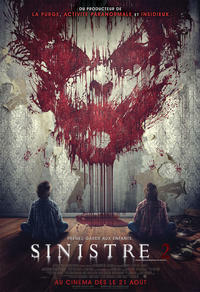 Sinister 2 is not a bad film. James Ransone is terrific as an unlikely hero, and I appreciated that aspect of the film. Citadel director Foy stages similarly authentic re-creations of amateur filmmaking, although he otherwise relies excessively on moody lighting, gotcha scares and Bill Boes’ expertly attuned production design to set the unsettling mood. Supernatural domestic abuse drama "Sinister 2" is an ungainly combination of two different narratives.